I have had a bit of a "dumb moment". I have been doing a semi countdown until Halloween (my daughter is very excited!) but for some odd reason it never really clicked that it is also the last day of the month which of course is monthly favourites time. Luckily I remembered now or this post might have been a little later than usual. Right, let's talk about all the things I have been loving this month. This month I don't feel like I have done much nail art. Probably because I did so much nail art last month and needed a little break (plus had a lot of swatching to catch up with). 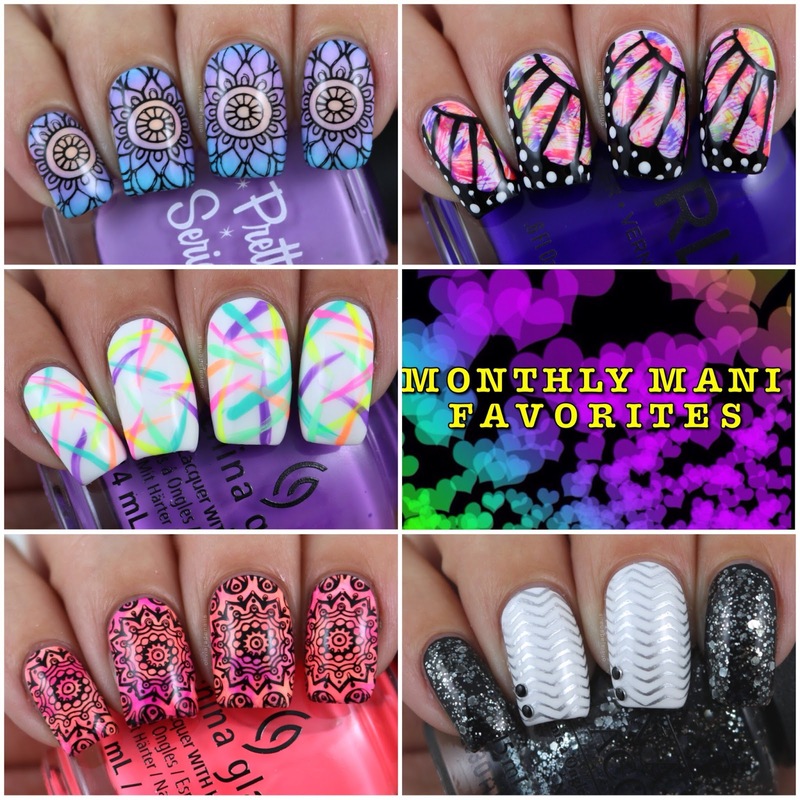 These are the nail art manis that I have loved this month. I have had a few new plates (or plates that I have only gotten around to playing with) that I have fallen in love with this month. There are some seriously awesome plates out there at the moment! October is the month of Halloween so of course I would have to pop in this plate. It's an awesome plate with Halloween designs for everyone! I am a huge fan of textured stamping plates and this one is no exception. I'm sure if you saw the original post on this plate, then it will be of no surprise that this plate is here. I could rave about it all over again, but let's save some time. You can see the original post here. When it comes to stampers there is a couple of things that I need. I need a stamper that is squishy (they just work better on my curved nails), one that doesn't require priming and one that works. Well, Hit The Bottle's Double Stamper is perfect for me. It's crystal clear so makes layering and placement of images easy and it also is really pretty. Plus has two stamper heads! It's no surprise that Hit The Bottle Shazam Yellow is here in my favourites. I love all of the polishes from the Pour Some Neon On Me Collection and Shazam Yellow is perfect. It's a great colour and stamps beautifully over dark and light colours. Indie polishes make up the bulk of the polishes that I have been loving this month! In fact, it's pretty much all polishes from my favourite brands (the same brands I'm sure I put in every monthly favourites). I am a huge fan of Halloween polishes. 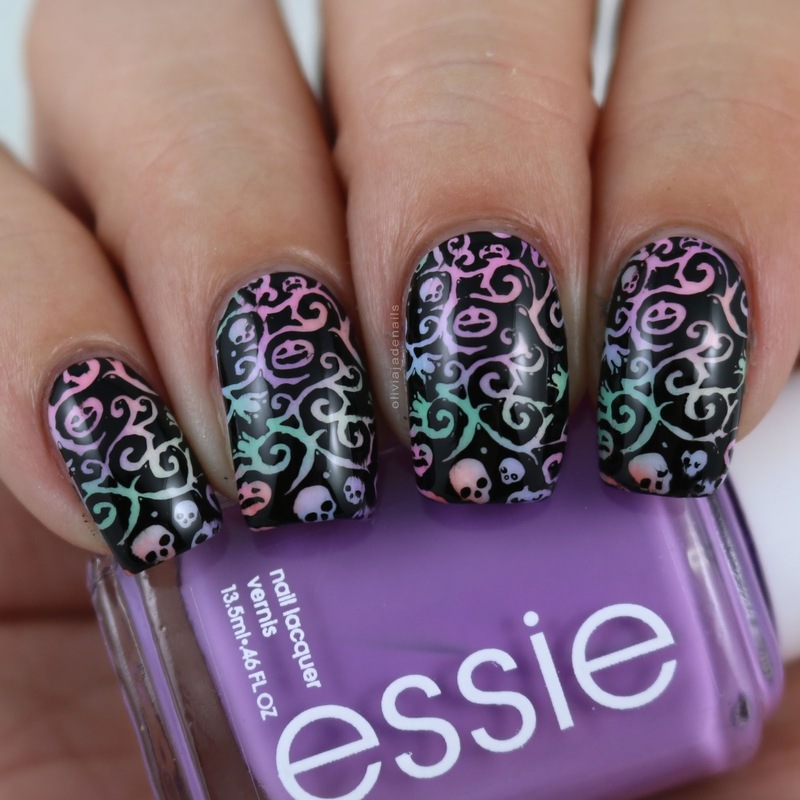 I think there are always some really interesting and unique polishes that come out at Halloween. Emily de Molly did not let me down this year! I was definitely late in swatching these polishes (and trust me it has been quite difficult having them sit in my swatch racks for so long) but I love them all! August was a great month for releases from Emily de Molly. In an effort to cut back on my favourites (which I really struggle at doing - doing a yearly favourites post is going to be the hardest thing I have done all year) I have managed to cut back my favourites from the October Release. Polishes shown are Ever Sort After, Land Of Critique, End Of Seasons, Stylish Cover Up and The Plain Wall. I'm really not sure what I can say about this collection that I haven't already said. The polishes are all gorgeous and the formulas are awesome. 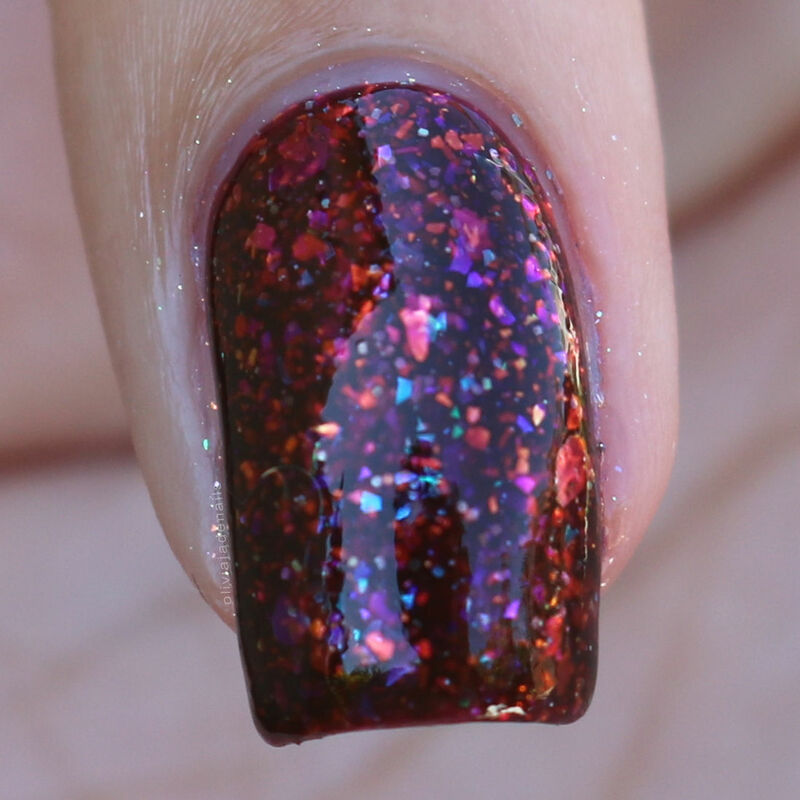 Another Halloween polish that I feel in love with this month. I love how different this one looks in different lights. Its so pretty and interesting. There are three favourites of mine in the new Haunted Mansion Collection - Darkness & Dragons, Beast Within and Dead Of Night. Such stunners! I didn't really play with too many main stream polishes this month (but there will be lots coming in November so keep your eyes peeled for those!). I did however play with a few new Dance Legend polishes. Are Dance Legend classed as main stream or are they more indie? I feel like they are some where in between. These polishes are all definitely very 'me' polishes and I just love them. There are so beautiful. That wraps it up for October. I can't believe it's already nearly November. The next two months are going to fly by so fast. I am definitely not prepared. Let me know some of the things that you have been loving this month. Anyone who stamps (or has tried stamping) knows how important a good stamper is. 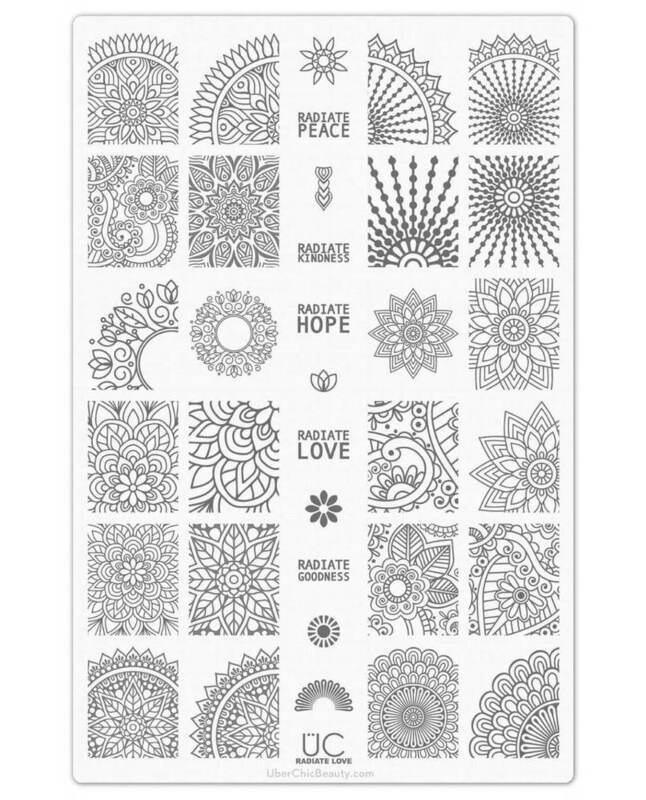 Finding a stamper that works for you can be quite the challenge. I personally have been through so many stampers over the years. I've had firm stampers (they definitely don't work for my curved nails), ones that require priming (or simply don't pick up anything no matter what you do), sticky ones......really the list just goes on and on. 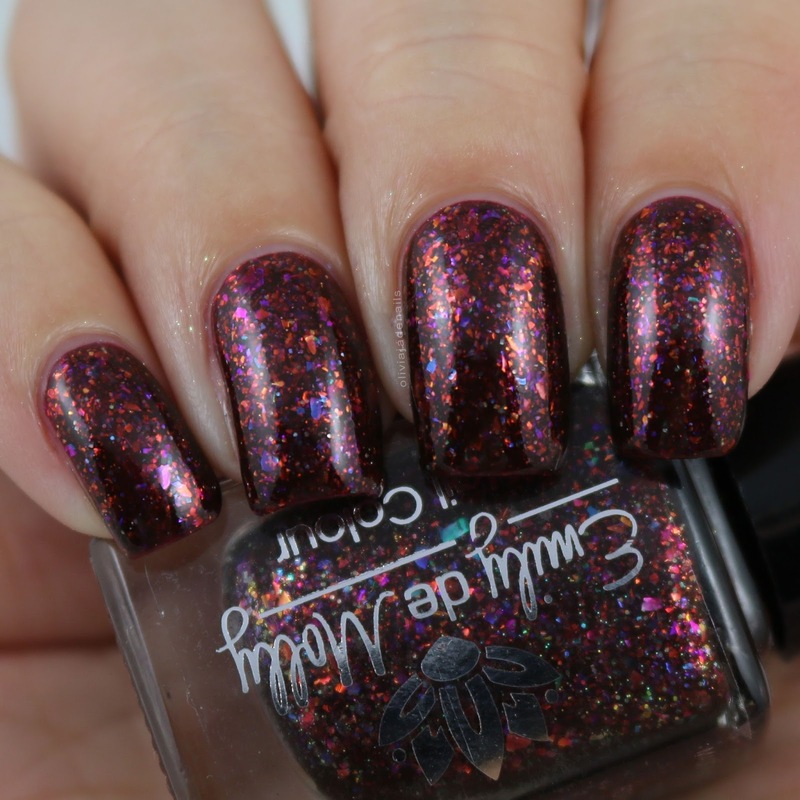 The newest, and definitely a favourite of mine is Hit The Bottle Double Shot Stamper. 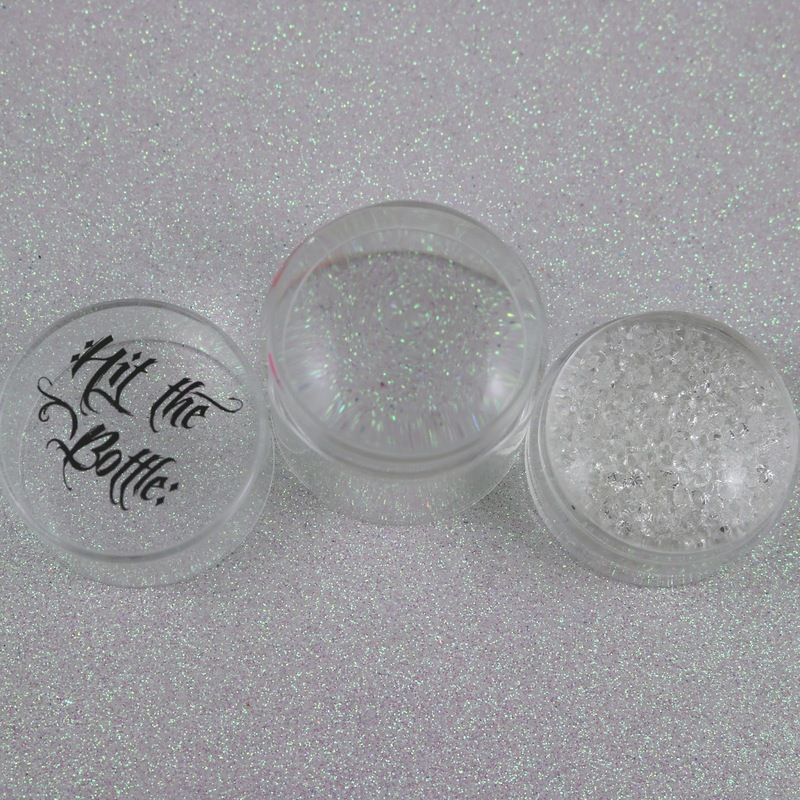 The Double Shot Stamper looks quite similar to the Big Bling Stamper that people rave about (and yes I am one of those people) but the Double Shot stamper has one big difference - it has two heads! Both heads are the same size, are quite squishy so are perfect for my curved nails and don't require any priming. What is the benefit of having two heads you ask? Well there are a few benefits. If you make decals you automatically have two stamper heads. You have the option of using the larger end for manis that require precise placement/layering and the smaller side for other sorts of manis. Most simply, you can save one of the heads for when the other wears out (transparent stampers are quite fragile in comparison to other stampers). This is one of the manis that I have done using the Double Shot Stamper. For my base I used Color Club French Tips and stamped using Hit The Bottle High Voltage Violet, I Pink Therefore I Am and Orange You Excited. Stamping design is from Lina Nail Art Supplies I Foil In Love 01 (which you can also get from Hit The Bottle - it's like a one stop stamping shop). If you are in the market for a new (and very pretty) stamper then I highly recommend the Double Shot Stamper. I haven't had any issues with the plates or polishes that I have used. This is definitely going to be a go to stamper for me. The Double Shot Stamper is available now from Hit The Bottle. 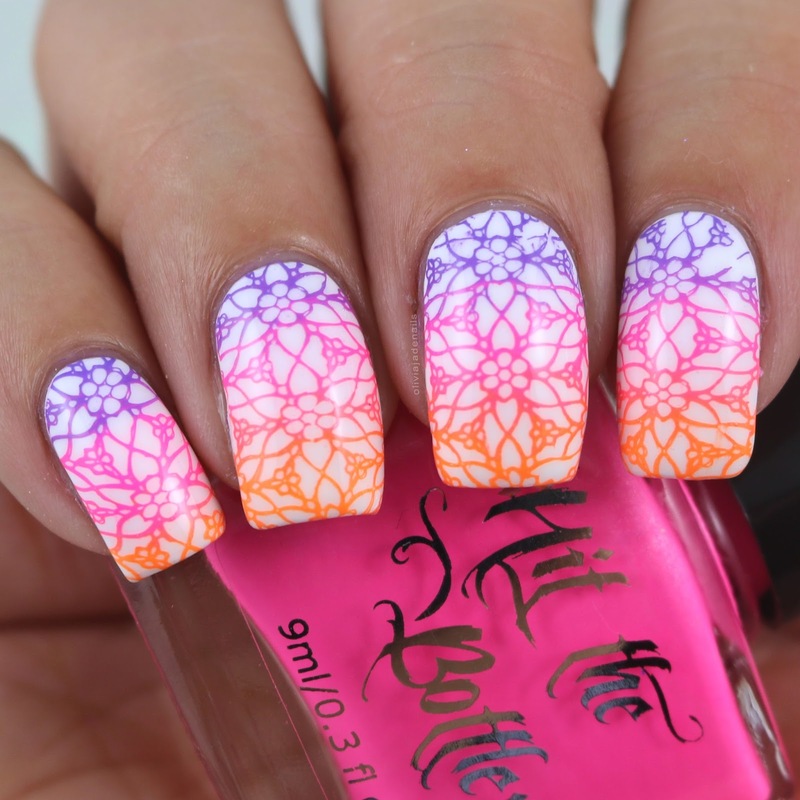 A little while ago I was lucky enough to be sent some of the neon stamping polishes from Hit The Bottle to test. You can see my original post with five of the polishes here. 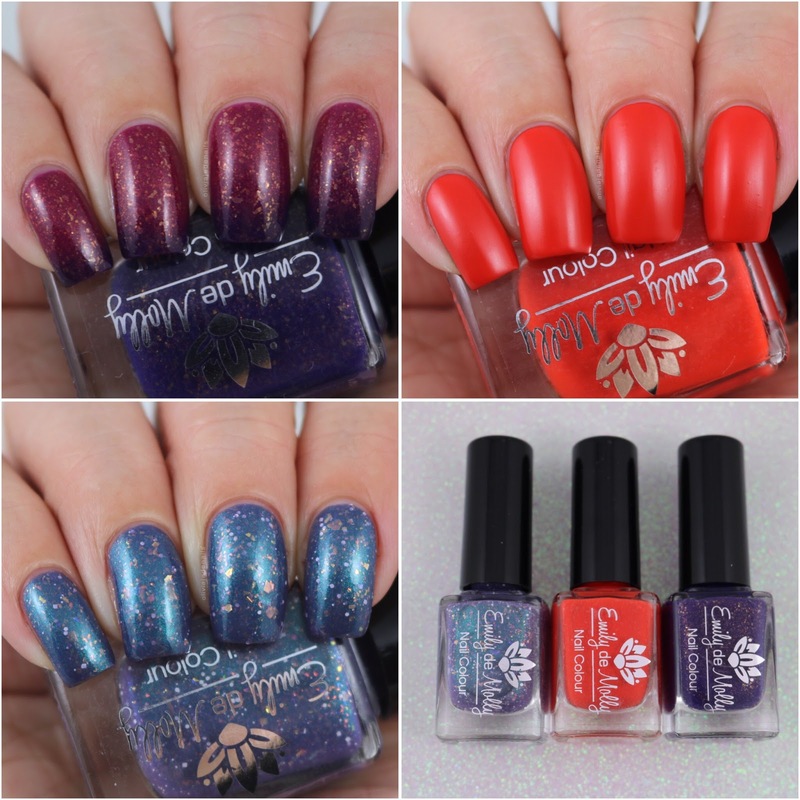 There are an additional two polishes in the collection which I didn't have, however Michelle was kind enough to send me some more of the neons along with some other goodies which I will share with you over the next few days. Anyway, there was a slight mix up with the polishes and I ended up with a double of one of them. I now have Shazam Yellow which I thought I would share with you today. Shazam Yellow is a neon yellow stamping polish. Like with the remaining of the Pour Some Neon On Me Collection this one stamps beautifully. 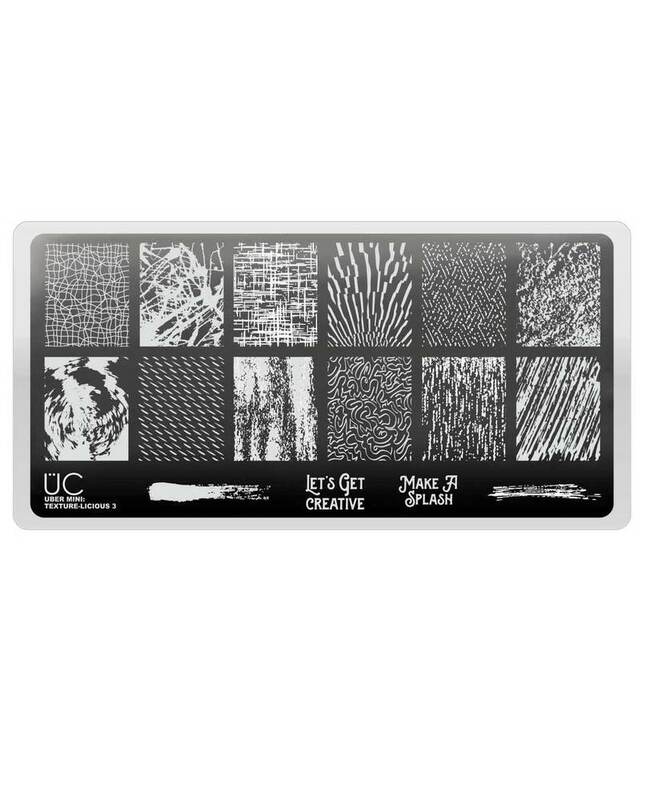 Image is from Lina Nail Art Supplies I Foil In Love 01 stamping plate. I love this stamping polish! 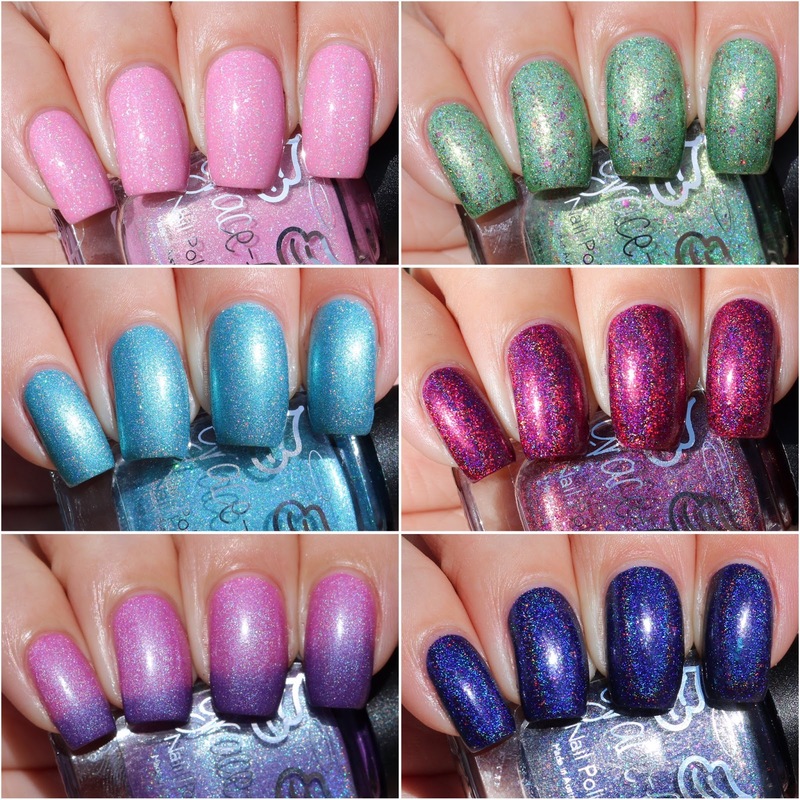 In fact I love the entire neon stamping range that Hit The Bottle have. Have your tried them? Shazam Yellow is available now from Hit The Bottle. At the beginning of this year I set the challenge to swatch all of the things that I have purchased this year and to finish swatching all of the polishes that I purchased last year. There has been some days where I honestly didn't think that I would manage to do it all but today I am feeling like I can (providing I keep my shopping habits to a minimum). At the moment I only have one collection of polishes from last year to swatch and five more collections from this year (that seems quite high - in my defense three of those collections I have only had for a couple of days). Why am I telling you all of this? 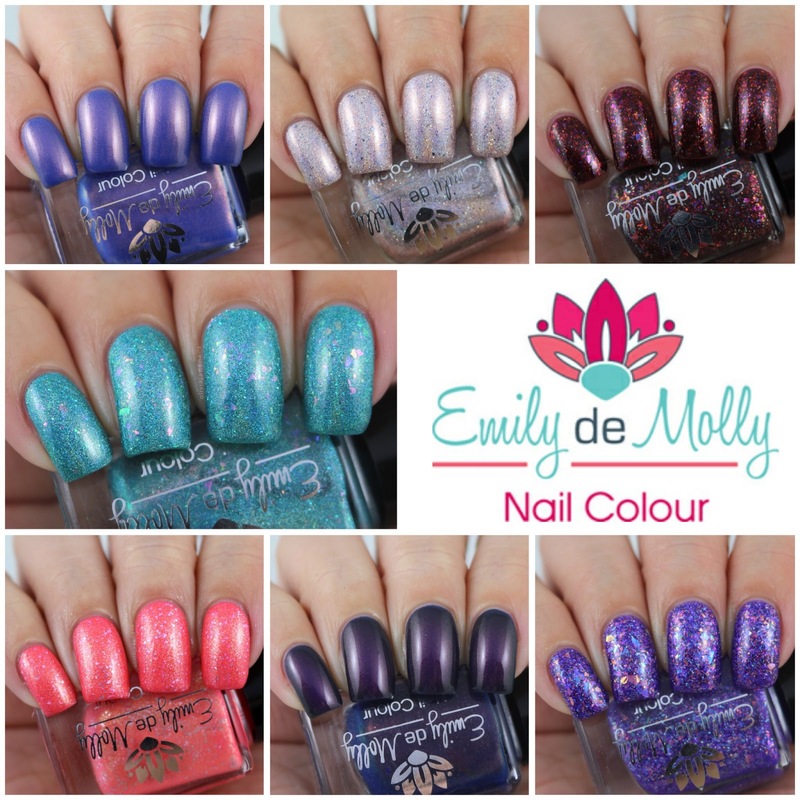 Well mainly because I am happy that I am making my way through the pile of things to swatch, but also Emily de Molly's August polishes have been sitting in my swatch racks for months and I have finally had the chance to swatch them and OMG! There are some AMAZING polishes in the mix. 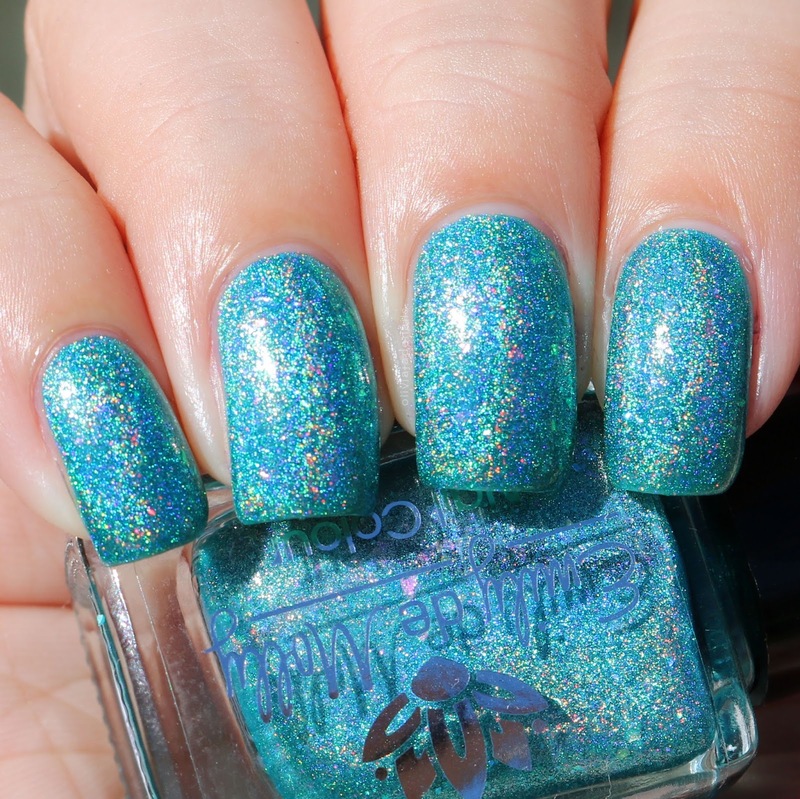 Everlasting Gaze is a turquoise green holographic with iridescent flakes and silver holographic micro glitter. This one is super pretty and the formula is great. I used two coats for my swatch, however it is still a little see through at tips in direct light. 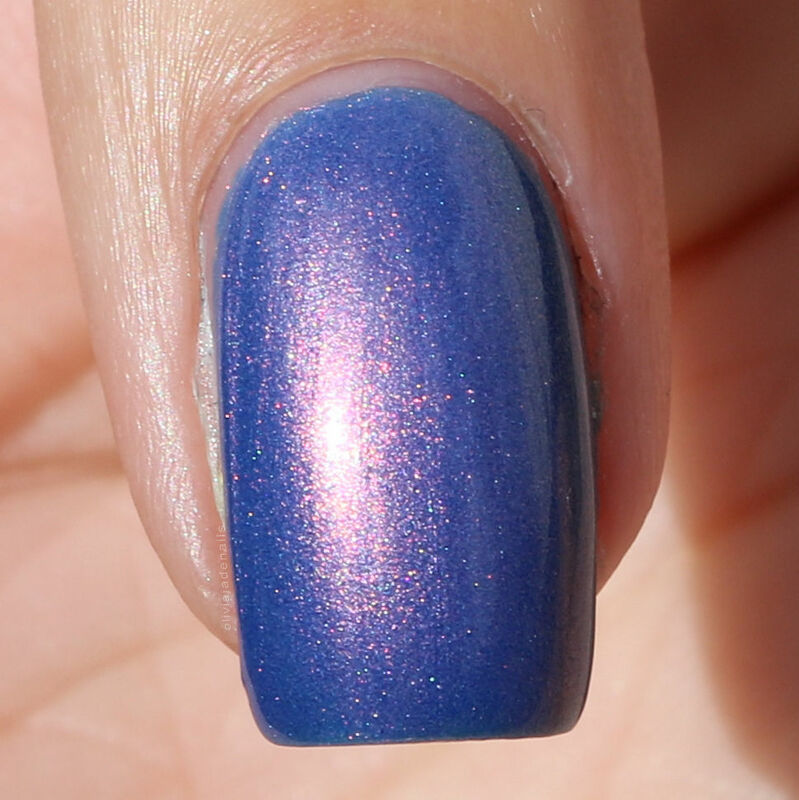 Midnight Serenade is a dark blue with pink/gold/green multichrome shimmer. This one is to die for! I think I could put this in my top favourites from Emily de Molly ever! My pictures really don't do it justice. The colour is awesome, the shift is fantastic and the formula is amazing. My swatch shows two coats. 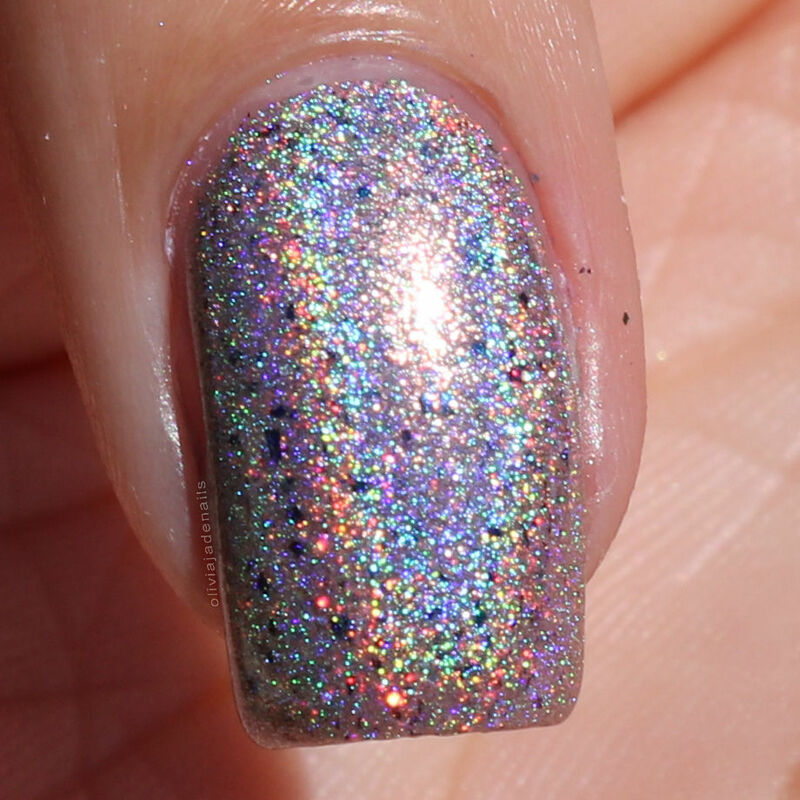 Now And Later is a neon pink with gold to green shifting shimmer and silver metallic micro glitters. 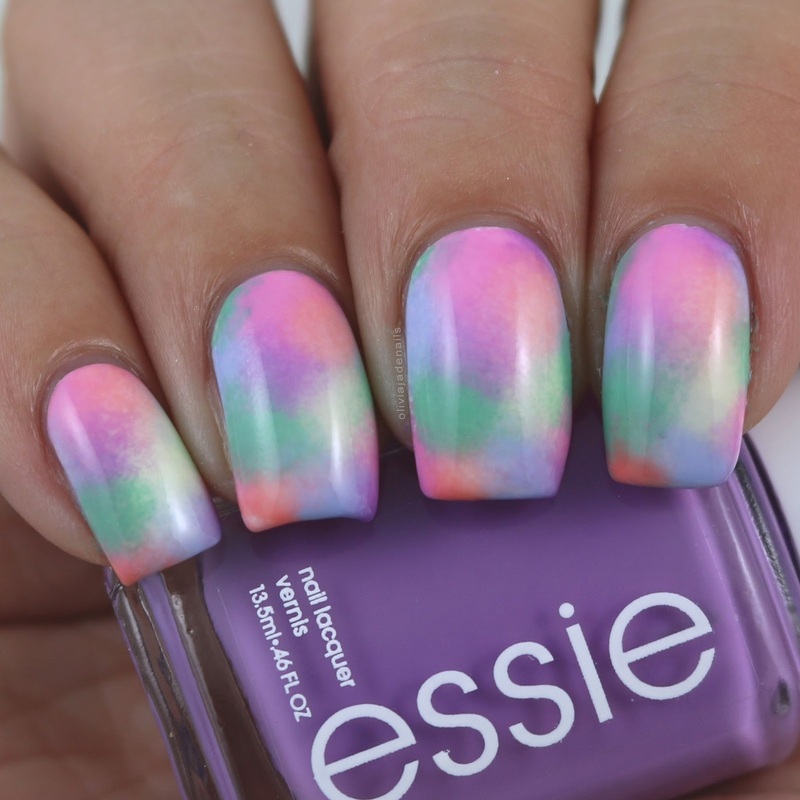 This is a perfect summer polish! The colour is great and so is the formula. I used three coats for my swatch. 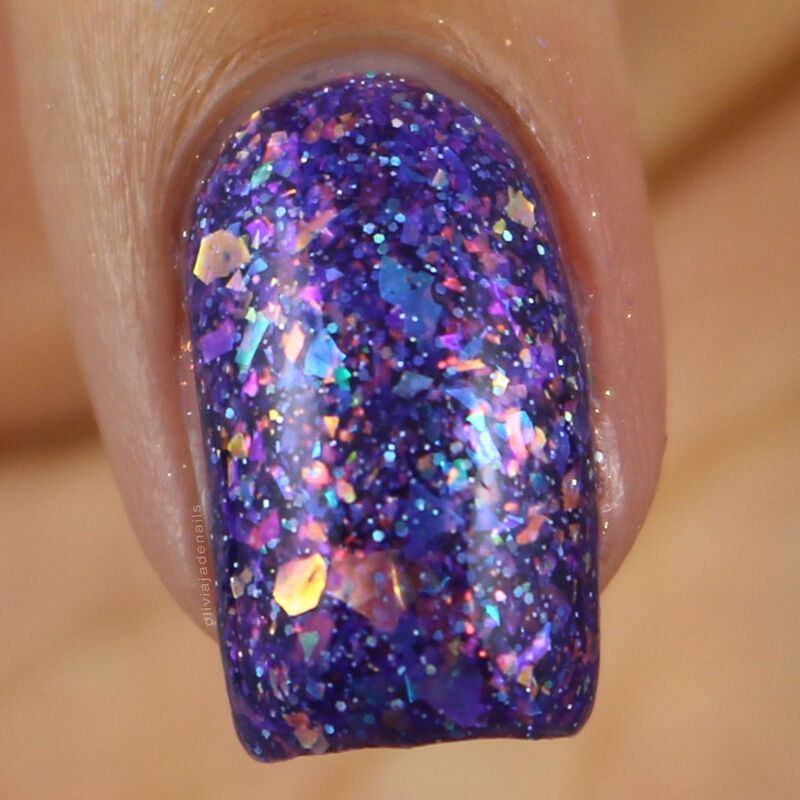 Sweet Sacrifice is a purple with iridescent flakes and silver holographic micro glitter. This one is really stunning and the formula is good. I did find it to be a little on the sheer side so needed three coats to build it up. It is still a little see through at the tips in direct light. 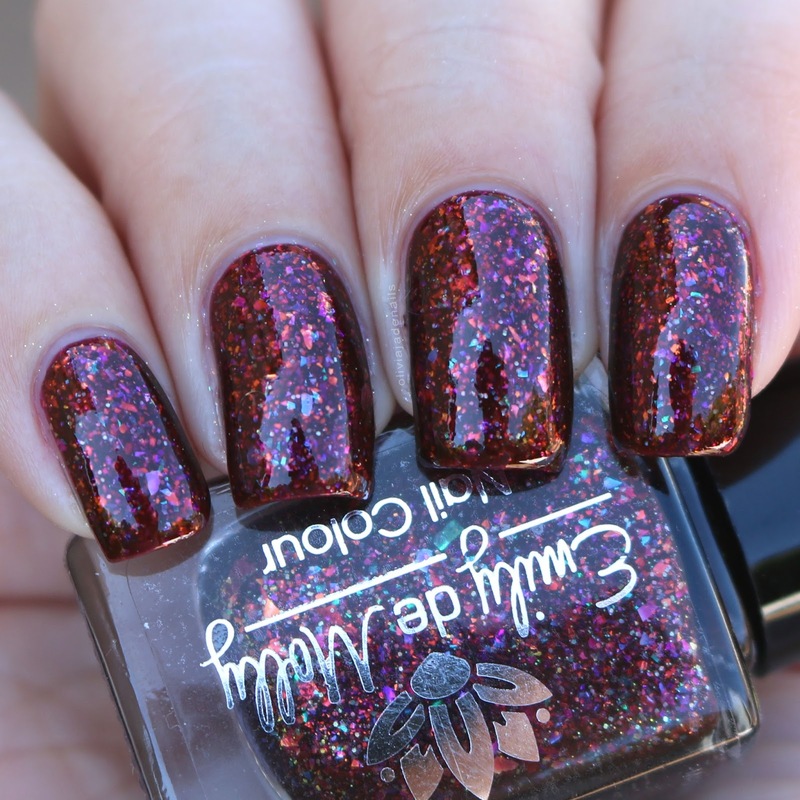 The Amber Palace is a reddish brown with iridescent flakes and gold holographic micro glitter. No surprise that I really like this one. I mean, it has flakies! The formula is also really easy to work with. I used two coats for my swatch, however I question if I should have done a third or not. This Moment is a pale rose gold holographic with blue chrome flakes and silver holographic micro glitter. 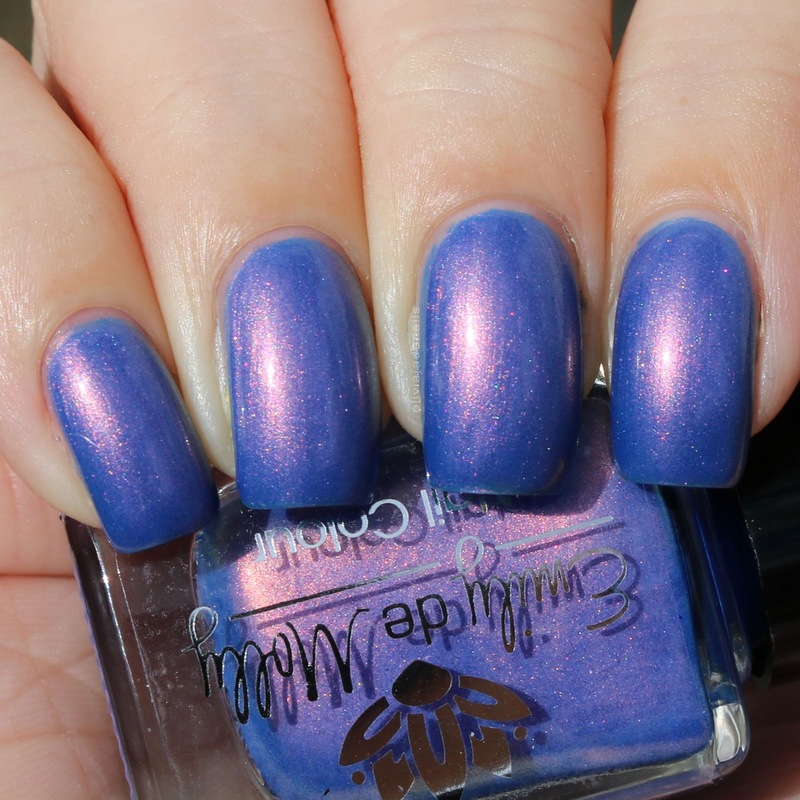 This is another beautiful polish with a great formula. My swatch shows three coats. Undo What's Done is a dark cornflower blue with copper shimmer. I'm a big fan of this polish too. I love the colour, the shimmer and the formula. My swatch shows two coats. I love all of the August Releases! 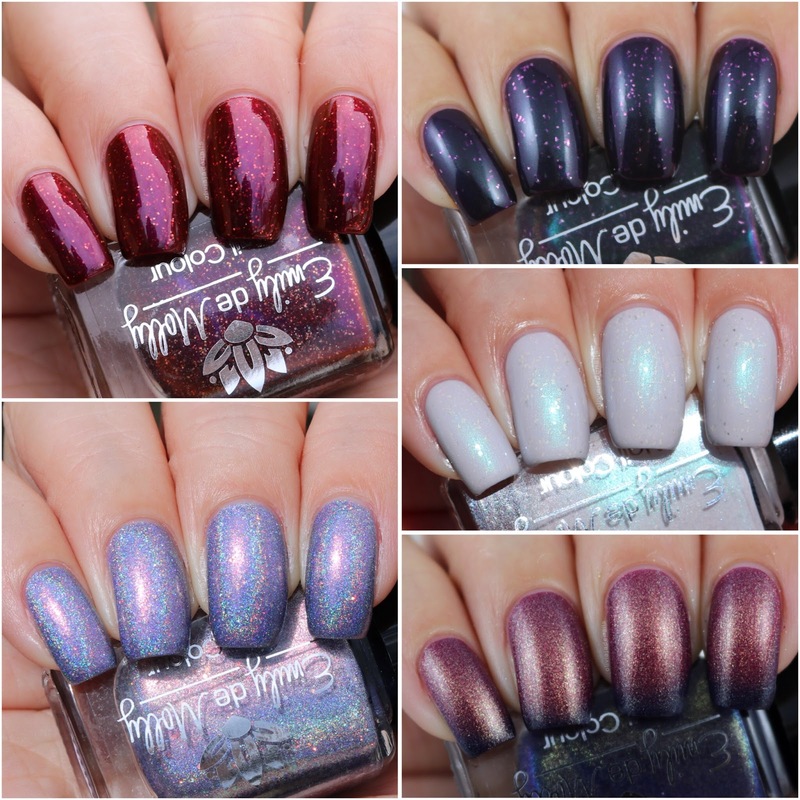 There are some amazing polishes. I'm really not sure I can pick favourites from this release. Which are your favourites? 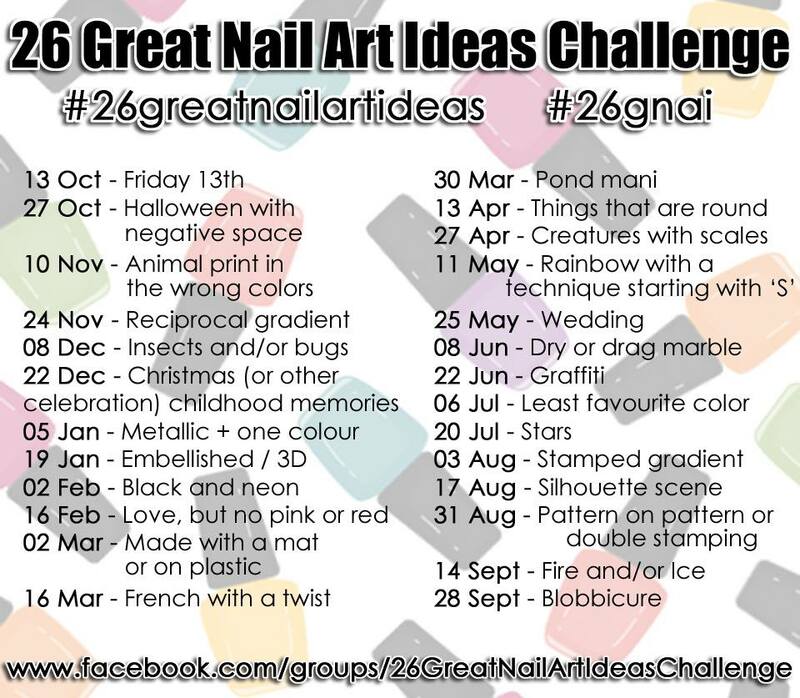 I'm back with my second for the 26 Great Nail Art Ideas Challenge. This week's theme is Halloween With Negative Space. I am pretty sure by "negative space" they were more going for a mani with naked parts of the nail, however I don't do naked nails. It doesn't matter if it's a full nail or just a little bit, I just don't like it. That being said, I decided to use a negative space stamping image. For my base (I'll pop a picture to the base by itself below) I used Essie's Backseat Besties, Saltwater Happy, Play Date, Resort Fling, Chillato and First Timer, and Powder Perfect's Black Stamping Polish. 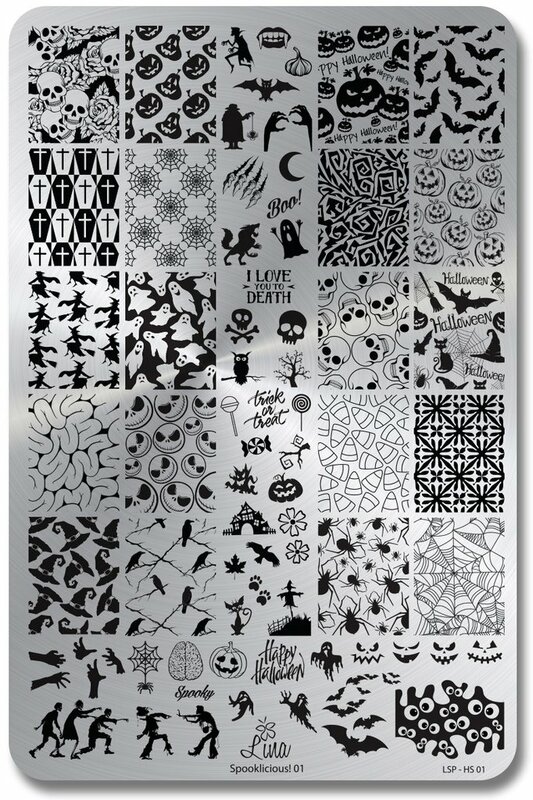 Stamping image is from Uberchic Halloween 02 stamping plate. I really love the base of this mani. Are you joining in with this challenge? There is still plenty of time to join!